Kabbara Engineering prepared performed the field and aerial topography for the project site and prepared construction drawings for the directional boring for the installation of a new 24â€? HDPE pipe and outlet structure on a biologically sensitive coastal canyon slope. This project replaced an old CMP pipe that was hanging on a slope face that was showing signs of movement. 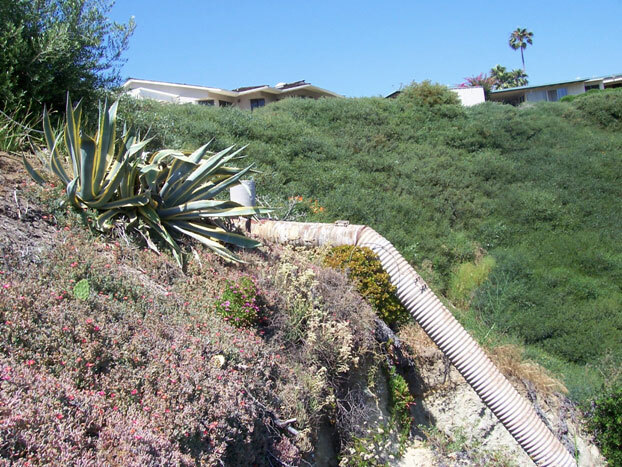 The project included a 125 foot directional bore at approximately 45 degrees from the boring pit located in an existing cul-de-sac at the top of slope, through a sideyard easement between two residential units to the bottom of the canyon. The Kabbara Engineering team also prepared the environmental documentation for this project, including permits from the USACOE and Fish and Game.